How to Make Mini Lemon Semifreddos. We are big fans of semifreddo desserts in our house. “Semifreddo” is an Italian word meaning “half-frozen” and that’s exactly what these desserts are. Imagine a soft, slightly frozen taste of deliciousness that’s half-way between ice cream and mousse, and you’ve got the idea. It has a light and airy texture, and best of all – no ice cream maker is required! These recipes are generally very easy, involve no baking, and can take the shape of any container you choose. You basically make a cream-based mixture, pour it into a pan lined with plastic wrap, freeze, unmold, and voilà – your “cake” is ready. I sometimes love to make my semifreddo in a heart-shaped springform pan, for a special occasion dessert. You can see an example here , using the same recipe I show in this post. You can also make it in a round pan like I did with this Chocolate Brownie Espresso Semifreddo. I once even tripled a recipe and made it in a huge mixing bowl for a New Year’s Eve crowd, turning it into a dramatic dome-shaped dessert. Today I thought I would try making a mini version in small mason jars, since individual desserts are a fun way to change things up. Of all the versions I’ve tried, this lemon one is our family favourite. It has just the right flavour balance between tangy and sweet, and is sure to please a crowd. Here is everything you need to know to make this delicious dessert for yourself. The first part of the recipe involves making a simple lemon custard by stirring eggs, lemon juice, lemon rind, and sugar in a double boiler until it thickens. I just use a bowl propped over a pot of water. You cool the custard down and then fold in some whipped cream. I make sure to stir the custard as it’s cooling so it doesn’t develop a skin. 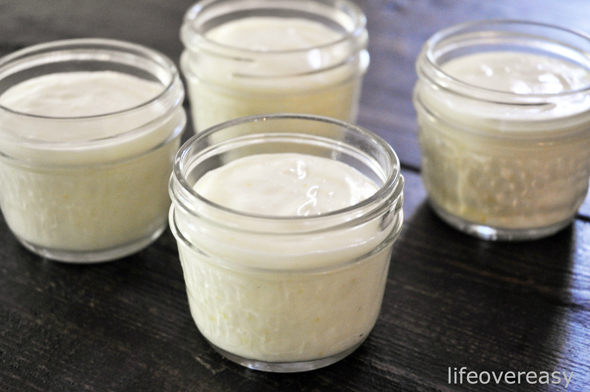 Wash and dry your mason jars, and fill with the lemon mixture. Freeze for an hour or so to set. You can leave them just like this if you want to keep things simple. 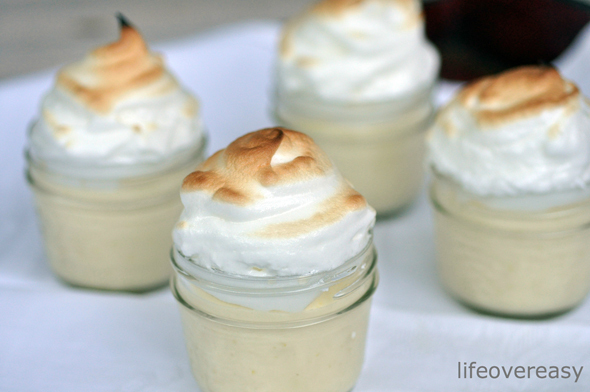 When you serve them you can add a little whipped cream or berries on top if you like. 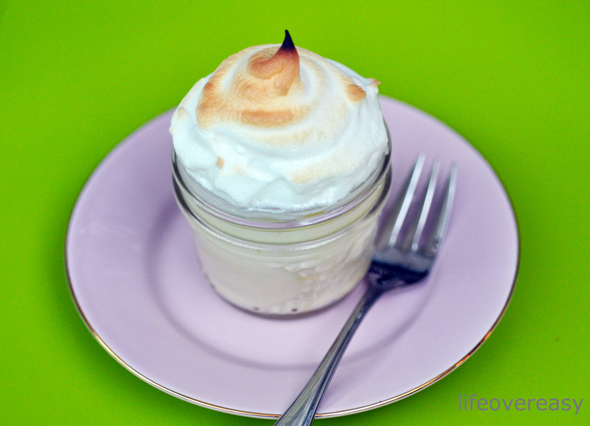 You can also add a Baked Alaska touch like I did here. After freezing for an hour, top with whipped and sweetened egg whites, and then broil them on the lowest rack just for a minute or so until the meringue browns. Pop them back in the freezer to store. When you’re ready to serve, just put them in the fridge for 20 minutes to soften. And then get ready for the oohs and aahs from the crowd when you serve them! Wash and dry 12 mini mason jars (125 ml size). 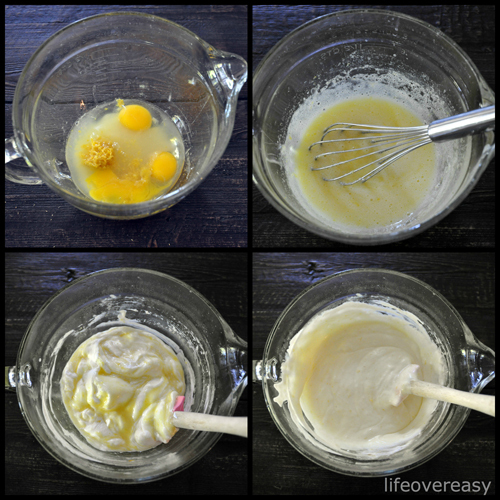 In a double boiler, whisk together the 5 egg yolks and 2 egg whites, 1 cup sugar, lemon rind, and lemon juice. Cook on medium heat, stirring until thickened (about 5 minutes). Cool, stirring occasionally. Whip the cream. Fold in the cooled lemon curd. Spoon the lemon mixture into jars. Freeze 1 hour. Beat 4 egg whites with ¼ cup sugar and a pinch of cream of tartar until firm peaks form. Pile on top of mini semifreddos and place under broiler on the lowest rack for about 1 minute to brown the meringue topping. Store in the freezer. Put semifreddos in refrigerator 20 minutes before serving to soften. Dani is an engineer who has the most fun when she’s engineering good times with her family. She’s a mom of 2 amazing teens who teach her about all the important things in life. 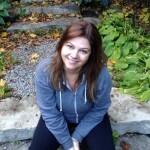 She hangs out at the blog lifeovereasy and loves to write about food, fun, design, and creating a happy home. They look so cute in the little mason jars. This sounds like a fairly easy dessert recipe that even I couldn't mess up. I'm def going to try it! OMG those look delicious! thanks for posting such a great and easy recipe Nancy / Dani! This is going to happen over here. They look positively scrumptious and beautiful! Yummy That looks really delicious! Those look heavenly. When I saw the picture I seriously wondered if you used a blow torch like you see on the TV shows 🙂 Broiling seems like a much safer alternative! YUM! Looks delicious! I've never heard of them, but I'm definitely willing to give them a try. I've never heard of these! Thanks for explaining what they are–sounds delicious! Not only did I not know how to make these, I never heard of them. They look delicious. I've never heard of semifreddos, but they sound and look absolutely delicious. These pictures are gorgeous and I love the mini mason jars they're made in. Definitely something I'll have to add to my bookmarks, I love that although it's delicious it's light and sweet! I've never even heard of mini mason jars, so cute! I'm glad you explained what semifreddo meant, I was trying to figure it out. 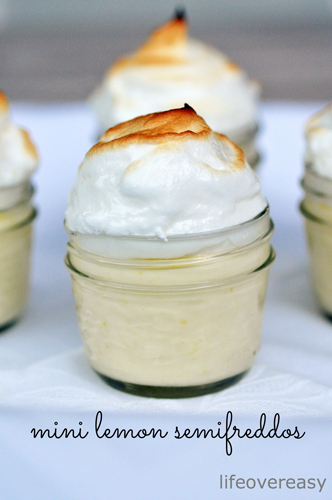 Very cute desserts, great for a dinner party. Thanks so much for having me over Nancy! It's been really fun visiting. This is one of my daughter's favourite desserts – I was really happy to be able to share it. TY for contributing such a lovely post, it\’s a hit and I know once we try them, it\’ll be a favorite! I love the mini-mason jars. I think that is genius. I am going to have to shop for some that is a great way of presenting them. They are super cute, I want to get some too! my mouth is watering already. These look and sound delicious and are just up my street. Thanks for sharing with us. Those look and sound yummy. I like the recipe! These look impressive, and I can't wait to try making them. I love lemony sweets! oh oh, I just got hit by cupid's arrow – these are so adorable. The mason jars add that informal fun attitude, instead of a high priced straight laced serious restaurant. And the ingredients aren't so expensive you need to take out a loan! Yet the result is priceless!!!! These are going to be absolutely delicious especially this summer.Lemon is my favorite of all flavors and this sounds sublime.Thanks for sharing. My pleasure, let me know if you try them.